The TEMPUR-Flex Elite is the top-of-the-line model from the Flex category and has a medium-firm overall feel. The Split King size of this model is designed for extra tall people who want the classic benefits of a Tempur-Pedic hybrid mattress. At the heart of the TEMPUR-Flex Elite, the Dynamic Support Coil System provides the support you need for your back and body. A layer of TEMPUR-Response material works with the coil system for a highly responsive combination that gives the TEMPUR-Flex Elite a springier feel than other models. On top of that, a layer of TEMPUR-ES material contours to the curves of the body reducing pressure points for comfortable, deep sleep. The quilt of the TEMPUR-Flex Elite is designed with EasyRefresh technology that allows it to be zipped-off for cleaning or replacement. This is a great way to keep your sleeping surface clean and free of allergens. The quilt also has antimicrobial properties that help prevent microorganisms and dust mites from taking hold and contaminating your sleep environment. The smooth top quilt is flexible, stretching without hindering the responsiveness of the comfort materials. The quilt also features SmartClimate technology to help regulate the surface temperature of the mattress and keep you comfortably cool. 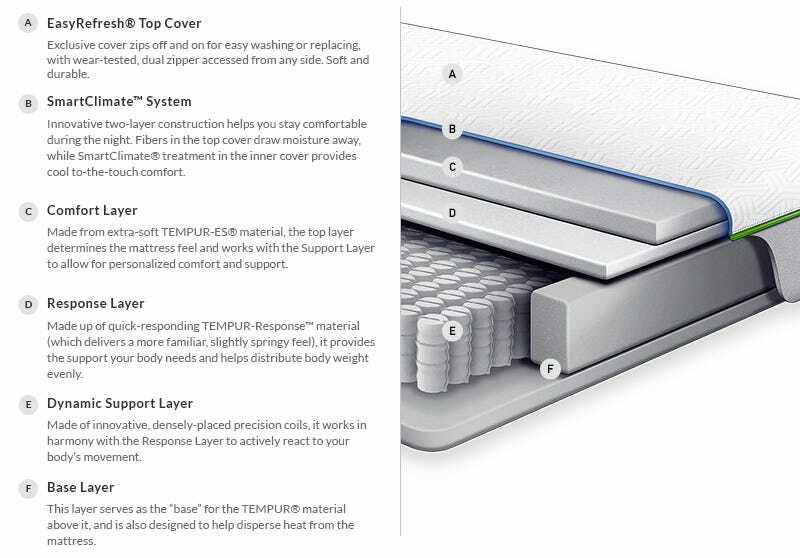 In conclusion, the Split King size TEMPUR-Flex Elite is a great choice for tall folks who want to experience the many benefits of a Tempur-Pedic, but also want the dependability and support of an innerspring system. This is one of the best hybrid mattresses available today for those who enjoy a soft comfort.